Residential window tinting is gaining in popularity as more and more people become aware of the benefits. If you need home window tint in Broward, Coral Springs, Fort Lauderdale, Pembroke Pines, Pompano Beach, Sunrise or Weston, FL then you should contact West Broward Tint. Your windows are an important aspect of your home and one could not imagine a home without windows. However a lot of sunlight enters through your windows and that light includes harmful UV rays that can cause skin problems and damage and fade upholstery, artwork and other possessions. Tinted windows substantially reduce the amount of harmful UV rays that enter your home. High quality tint such as that used by West Broward block most of the harmful rays thereby keeping you and your family healthier. Home window tint also helps to protect your furniture, floors, paintings, upholstery and other valuables inside your home. Since tinted windows block a great deal of solar energy it helps to keep your home cooler during hot summer months. That should reduce your reliance on your aircon and help save on utility bills. Privacy is another important aspect a home window tint. Outsiders cannot see inside your home but you still have a complete view to the outside. Glare reduction is another great feature of window tinting and this is particularly useful for properties with a sea view. Tinted windows also look smart and can enhance the overall appearance of your property. If you want to enhance the appearance of your home, protect your family and valuables from harmful ultra violet rays then residential window tinting is for you. Speak to the experts at West Broward Tint and you might also be pleasantly surprised by the cost of your home window tint. How About Giving Your Yacht A New Look With Marine Window Tinting? Do you have a yacht and are thinking about boosting its appearance? You can now benefit from marine window tinting services all across Broward, Coral Springs, Fort Lauderdale, Pembroke Pines, Pompano Beach, Sunrise, Weston, FL. The service is convenient, it is done at home (or wherever the yacht is docked), and on top of that it is of very high quality too. Not to mention how practical marine window tinting is… and how affordable. As you can see, there are numerous benefits of window tinting, and as soon as you try it on your boat you may want to use window tinting on the windows at home or even for your car. It keeps the intrusive sun rays at distance and at the same time auto window tinting offers you the privacy you need. It goes the same way with your home windows; it’s really a simple solution if you want to increase your privacy. But now let’s talk a bit about marine window tinting. The tinting process is fast: all you have to do is contact a specialist from West Broward Tint and make an appointment. The representative will also give you some useful guidelines on the type of tinting you should use on your boat, as well as valuable advice on its maintenance. Then they will send a marine window tinting team at your boat to complete the tinting process. You can immediately notice the benefits. When you’re navigating on the ocean, the water reflects the sun’s rays. This can be very unpleasant, giving you headaches and making it very difficult to navigate. With marine window tinting this changes instantly: no more intrusive sun rays keep you from reaching your destination, and boat trips suddenly become more enjoyable. Find out more about marine window tinting by contacting one of our representatives now. Imagine having residential window tinting done for you, at home, without having to waste precious time and money having it done at a service. Would you like that? Then if you live in Broward, Coral Springs, Fort Lauderdale, Pembroke Pines, Pompano Beach, Sunrise, Weston, FL this article about home window tint is for you. Residential window tinting increases your home’s privacy, keeping the curious eyes of your neighbors at distance. However, until recently you had to put a lot of effort into having your windows tinted, since you could hardly find a company willing to do the job at your home in Broward, Coral Springs, Fort Lauderdale, Pembroke Pines, Pompano Beach, Sunrise, Weston, FL. Now this is possible thanks to the new technology used by West Broward Tint. And privacy is not even the biggest concern of some of our clients. 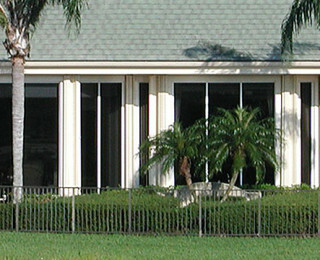 Believe it or not, residential window tint makes sense in the sunny areas of Florida. Don’t get us wrong, everybody from Florida adores the sunny and warm days we’ve been blessed with. However, the sun rays are not that friendly with our furniture or belongings; in time, sun can affect the color and quality of some of our dearest belongings: pictures, paintings, furniture, photographs, even curtains can get discolored from too much sun. But residential window tinting comes to the rescue. Using a solar controlled film that is manufactured using a polyester base, the material is attached to your windows and it has the “magic” power of keeping the harmful sunrays at distance. The best part about this service is that it is done at your home. All you have to do is contact a representative of West Broward Tint from your area in Broward, Coral Springs, Fort Lauderdale, Pembroke Pines, Pompano Beach, Sunrise, Weston, FL and make an appointment. You can also contact them for more information regarding home window tint. If you want to reduce glare and harmful UV rays in your home then you should consider residential window tinting. If you reside in Broward, Coral Springs, Fort Lauderdale, Pembroke Pines, Pompano Beach, Sunrise or Weston, FL, then you can get your windows by West Broward Tint. We all know how uncomfortable glare from sunlight can be and you probably don’t want to walk around wearing sunglasses all the time. Window tinting will reduces sunlight glare so you don’t have to squint every time you look out a window. If you have a waterfront property the glare will be amplified and much worse making residential window tinting an attractive option. The bands of light that enter through your windows contain harmful UV radiation in the form of Ultraviolet A (long wave) and ultraviolet B (shortwave) rays. These rays are part of the spectrum of light emitted from the sun and they enter your home together with normal visible light. Unfortunately these rays are harmful to your skin, your eyes and your immune system. Excessive exposure can result in premature aging of the skin, as well as skin tumours and cancers. They are also harmful to the eyes and can result in cataracts. In addition excessive exposure can lower the immune system and reduce its ability to fight these and other conditions. Window tinting helps to reduce the penetration of harmful UV rays and this is better for your health. Sunlight can also cause furniture and upholstery fade and become jaded. Residential window tinting will also prolong the life of your upholstery and collections. But that’s not all. Tinted windows keep your home cooler in summer and warmer in winter thereby reducing the demands on your air conditioning system. This way you save money on energy bills and this alone can pay for your window tinting over time. Not to mention that tinted windows provides you with more privacy. You can still see outside but outsiders can’t see in. What’s more is tinted windows can also look cool and add to the aesthetics of your home. So you know where to go for residential window tinting. When the sunlight hits the water the glare can be blinding. When you are on a boat you will regularly be exposed to this harmful glare. Marine window tinting will help protect you from this glare and also provide you and your passengers with additional privacy. For professional marine window tinting in Broward, Coral Springs, Fort Lauderdale, Pembroke Pines, Pompano Beach, Sunrise or Weston, FL you should consult with the experts at West Broward Tint. Glare reduction and UV protection are two definite benefit of marine window tinting, but there are plenty other advantages as well. Window tinting is cool and visually pleasing. Your boat will just look smarter and more distinct with professional tinting. Tinting also increase outside visibility while blocking. Window tinting also improves comfort in that it keeps you cooler in winter and warmer in summer. Normal windows allow all the light and heat to enter your cabin whilst tinted windows reduce the amount of light and heat thereby lowering the temperature to a more comfortable level. Less light and glare inside your boat also makes it easier to see your smartphone and tablet screens. By blocking UVA and UVB rays, tinted windows protect you as well as the furniture and upholstery inside your boat. If you decide to improve the appearance of your boat and to invest in glare reduction by way of marine window tinting, you must deal with the people who have experience in the field. The wrong type of film can interfere with your vessels electronics and LED displays. The experts at West Broward Tint know which types of film are suitable for boats and marine craft. Marine window tinting should reduce glare, block harmful UV rays, increase comfort and enhance the appearance of your boat – it must not interfere with important radio and other electronic signals. Restoration projects can be really expensive. Plus, you will need to dedicate a lot of time to such a project if you want to get the desired results. A cheaper alternative to a full restoration process is mobile window tinting. Its advantages are obvious, but probably the best thing about mobile window tinting is that you don’t have to move a finger to get the job done. Allow us to explain in detail what mobile window tinting services are. Mobile window tinting services in Broward, Coral Springs, Fort Lauderdale, Pembroke Pines, Pompano Beach, Sunrise, Weston, FL are becoming increasingly popular. It is very convenient for people to have the mobile tinting expert come to their home rather than having to take their car, boat, or windows to a tinting shop. That is exactly what the service is about: it’s tinting for everything, at your home. A lot of people spend their time between work and family life, leaving them with very little free time for personal projects. What is more, some of them don’t have the necessary skills to complete DIY projects at home. However, in some cases, window tinting is necessary: it contributes to prolonging the lifespan of home objects (paintings, sofas, furniture, and so on), it keeps away the curious looks of neighbors or those walking by your home, and it keeps intrusive sun rays away as well. So if you wish you had window tints at home but don’t know how to apply tints the RIGHT way… if you don’t have time for such a project… or if you simply want the job done in a professional manner, then you can contact a mobile window tinting company in your area now. For questions regarding the maintenance requirements of mobile window tinting contact one of the company’s representatives now. We are living in an era that is thirsty for light, so using window tinting at home can sound an absurd idea. Why would you want to install window tinting at home and just put your entire property under a shadow? Well, there are some situations when you simply cannot afford NOT to buy window tint. And there are several other benefits of home window tinting, so read on to find out what these are. For example, window tinting is recommended if your house has a porch and the porch is inundated with light. Glass porches can give you an amazing view over your garden, but they can also be unbearable during hot summer days. Glass heats the premises, so installing window tints can contribute to cooling down the atmosphere in the porch. If you live in a house or in an apartment that is located on the sunny part you can also consider installing window tints. On top of that, windows are a source of heat loss during winter, and window tints can contribute to making your home warmer. In the summer, on the other hand, window tints can be helpful in maintaining a pleasant atmosphere at home. Tinting protects colors from fading. If you live in a colourful home and have lots of colourful objects, you will notice that in time the quality of the colors deteriorates. This is because of the action of light, which makes the colors fade. Tinting can really give you back your privacy. If you live in a crowded area, in a block of flats or in a neighborhood with curious neighbors, window tinting can contribute to keeping your private life… private.